Why the escape rooms are so popular? If you want to experience intense emotions and test your intellect and intuition, then you will definitely like this game. Escape rooms have increased their popularity in recent years, and it is no accident. Thanks to the combination of intellectual challenges and high adrenalineescape rooms can offer a new kind of entertainment to everyone. They are an excellent option for those of you who want to have fun with your family and friends. Escape rooms offer an unusual way of forgetting our daily concerns and duties, and give us the opportunity to laugh with acquaintances or friends while testing our potential. They are a great combination of adventures and intense experiences. Suitable for both children and adults, families, couples, business partners, even strangers – all can participate in such a game. The full name of the escape rooms in English is: Real-life room escape game”, and actually gives a hint about the main goal of the game. Escape rooms are intended to take us out of reality and to put us in another reality. The main reason why escape rooms are so popular around the worldis becausethey just offer us something new. Escape games rise the adrenaline and bring the participants together. For this reason, escape games are preferred by big companies who want to unite their teams. They use them for a teambuilding purposes and what better way to bring closer the team than a fun and challenging gamewhereimportant decisionshave to be taken quickly,becausethe“survival” of the team depend on them. Escape rooms gained their greatest popularity in 2010. They became famous mostly in theUSA, Asia, Europe and Australia. In 2015,Sofia city gradually transformed intoone of the world centers with numerous high-tech and original escape rooms. In the beginning of 2016, there are already more than 80 escape rooms in Bulgaria, 64 of which are located in Sofia city. At the end of 2015 there are more than 2800 escape rooms around the world, and in the USA there is even areality TV show, which follows the events in an escape room. The TV show gathers almost 400 thousand viewers in front of the screens. This type of entertainment continues to gather popularity and has won the status of a modern game, as it has both intellectual and adventurous character. The puzzles in the room can be of varied type. They may be logical, mathematical, of linguistic character. The creators of the escape rooms are trying to invent newer mysteries and decors to maintain the interest of the fans and to be able always to offer something new as an experience. One of the most important things to do if we want to win in such a game is to keep the spirit of the team and prepare in advance withgood mood and attitude. Ultimately, the goal is to relax and forget for a while our daily worries. Escape rooms genres continue to be dynamic and unpredictable thanks to the genius of the escape rooms developers. Various skills are being tested, for example, observability, speed, logical and creative thinking, as well as the ability to work in a team. Inspiration for the creation of escape rooms creators take from video games, famous action, criminal and horror movies, historical events, real factsor just from their experience gained from previous participation in an already existing game. What is the experience in an escape room? 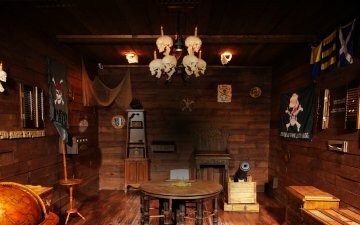 The escape room is a room with special décor in which there is a sequence of mysteries and puzzles that the creators of the escape room have previously invented.The escape game can usually be played by a team of two to six people, but in some games the number of participants can reach up to 10 people. The escape game is played in real time, as its duration is 1 or 2 hours. During this period, the team of playersis locked in the room where they have to solve different puzzles and mysteries. If the team manages to deal with the mysteries before the end of the game, then the team is a winner. According to polls carried out in China, escape rooms are a preferred entertainment method for students or stressed young professionals with tough schedule. As the game brings a lots of thrill and emotions, it doesn’t burden them, on the contrary, it helps them escape the reality in a unique way – racing against time. It is important to mention that the escape rooms are under constant video supervision by the organizers of the game, and they sometimes givedirections to the players in case that some of the mysteries are very difficult for them. An interesting fact is that the players in the escape rooms sign a declaration that after leaving the room they won’t reveal its secrets in order for it to be interesting for the future players. The games in the escape rooms are practiced as a form of teambuilding. Many companies choose to involve their employees in a more challenging and extreme situation, and they can express their unique characters in it. The escape rooms actually put the players in a bit different situations from those that they experience in their everyday lives. With regard tothe situation with children, the players have to be at least 12 years of age, and little kids are allowed to play only with an adult accompanying them.